Looking back at the county Local Agency Formation Commission's manipulation of Temecula's annexation process, it is hard to recall a hearing that did not inappropriately involve Granite Construction's proposed Liberty Quarry. "It is the intent of the Legislature that each commission establish policies and exercises its powers ... in a manner that encourages and provides planned, well-ordered, efficient urban development patterns with appropriate consideration of preserving open-space lands within those patterns." The next page adds the "orderly formation and development of local agencies based upon local conditions and circumstances." Note the repeated use of the word "local" and the absence of "regional." Try not to confuse "open space" with "open gravel pit" as the commission tends to do. Going back to the original annexation hearing of June 2009, LAFCO chairman Russell Kitahara stopped Temecula City Manager Shawn Nelson mid-sentence, concerned the parking structure would close, but then found time for one last speaker in favor of the Liberty Quarry project that has no application before LAFCO. On July 13, a reluctant Temecula council voted 5-0 to remove an existing sphere of influence from the proposed quarry site to suit the desires of the formation commission in order to annex 4,500 acres into the city boundaries. Councilman Mike Naggar had the audacity to verbalize dreams of hiking areas, park rangers and Scout troops learning about nature. That mental planning was more than LAFCO member Phil Williams could tolerate. "If you're going to master-plan something, that's not open space," he said. In the world of Williams, I suppose a 100-story deep gravel pit is preferable, because moving mountains of material could be bizarrely construed as creating more open space. Just days before LAFCO's scheduled meeting Thursday, Williams requested a late addition to the agenda to revisit Temecula's third annexation attempt that yields to LAFCO instructions bent on accommodating a gravel quarry application that is much more than just a vocalized thought out of somebody's head. Concerning Naggar's council comments that LAFCO proceedings have been "bizarre" and Councilman Ron Roberts' call for a grand jury investigation of the commission, Williams called those criticisms "secondary issues," adding, "If they truly feel that there's criminal activity, why not stop everything ..."
Because things are so upside down, let's start with this secondary issue, stop everything ---- including the quarry application ---- and investigate how Granite Construction has been at the forefront of the commission's consideration since Day One. PAUL JACOBS writes from Temecula. Contact him at TemeculaPaul@aol.com. Yogi Berra famously said, "When you come to a fork in the road, take it." It is doubtful any forks were taken when Gary Johnson of Liberty Quarry's Granite Construction treated Riverside County Local Agency Formation Commissioner Russell Kitahara to breakfast at the Fork in the Road restaurant in Coachella, as reported in a Press-Enterprise article posted July 14. At their July 13 meeting, three of five Temecula council members seriously questioned the conduct of the county formation commission, which acts more like an advocate for Liberty Quarry rather than an unbiased county agency charged with the basic responsibility of drawing lines on a map. Other than ensuring land-zoning consistencies, LAFCO is not supposed to be overly concerned with what happens within those lines. That is the function of the local, city or county agency and the reason for having planning commissions, city councils and county supervisors. Now that the three council members have had their suspicions supported by Kitahara's news article confession of not one but three meetings with Johnson, Temecula leaders are duty-bound to pursue a grand jury investigation of LAFCO. Of the Fork in the Road breakfast meeting, Kitahara remembered that he had "corned beef hash," the restaurant name and that the amount of his share of the bill covered by Johnson came to about $10, but details and dates of the discussion seem conveniently erased from memory like the 18.5 missing minutes of the Nixon White House recordings. The article quoted Kitahara, "I guess I didn't really listen to him that much, because I don't remember what he was trying to tell me." Kitahara is guilty of being a rude breakfast companion, if nothing else ---- and is it routine for Johnson to have things to tell him? Who was taking orders, the waitress or Kitahara? Agency executive director George Spiliotis reportedly claimed the meetings do not violate the commission's rules, which is shocking because from LAFCO's past conduct toward Temecula, I didn't think the super agency had any rules. Three of the five tines of the fork that are the Temecula City Council ---- Mike Naggar, Ron Roberts and Chuck Washington ---- have vocalized suspicion of impropriety within LAFCO. The entire council should back Roberts' call for grand jury and district attorney investigations. The city should also seek judicial relief from all past and present decisions going back to and including LAFCO's June 2009 denial of Temecula's annexation request. Granite Construction plays hardball and Temecula needs to step up to the plate. Now is the time to take that fork in the road. After Councilman Ron Roberts called for a grand jury investigation of the Local Agency Formation Commission's handling of Temecula's bid to annex about 5,000 acres at its southwest border ---- a portion of which Granite Construction wants to blast to blazes ---- that's the obvious question. There's been grumbling all along about the handling of Temecula's request by the commission and the first crack may have opened in the rocklike edifice with the revelation of at least one meeting between the commission's then-chairman Russell Kitahara, Coachella Valley Water District director, and Granite point man Gary Johnson. Such a meeting, if not illegal, is certainly of questionable judgment. Perhaps recognizing that to be the case, Kitahara told three quarry opponents just a couple weeks before the September 2009 hearing that he had "never" met with any Granite officials. It has been pointed out that Councilwoman Maryann Edwards met with George Spiliotis, LAFCO's executive officer, at the Santa Margarita Ecological Reserve which comprises the majority of the land the city was seeking to acquire. Edwards says she thought it would be helpful for the staff to see the substance of the application. For petitioners, in this case that's the city, to meet with LAFCO staff is not unusual. In fact the process wouldn't work if they couldn't meet. But staff doesn't vote. Commissioners do, so a trip to Coachella Valley by Granite's man to have breakfast with the commission's chairman is quite another matter. It's especially curious when the chairman can't remember what they found to talk about after Johnson drove all the way out there to see him. And Johnson didn't even invite Kitahara to see the proposed mine site. In the end, one supposes one hole looks pretty much like another. So, now what? Aside from whether and when the grand jury would investigate, we need to know what else is behind that wall waiting to seep from the just opened crack or perhaps even to create a new fissure. Thus we turn our eyes to other members and wonder what's the tab for breakfast? Remember, the state land-use commission predicted in its 2008 annual report that the quarry would be approved. Those state worker bees are so prescient. In the meantime, as imperative as a LAFCO probe is, we must not be distracted from the process as it wends its way to the Board of Supervisors for final action and the subsequent filing of lawsuit(s) by the losers. When we go to court, we want to go as winners, not losers. PHIL STRICKLAND writes from Temecula. Contact him at philipestrickland@yahoo.com. Tuesday's Temecula City Council meeting was a grand time to see some fire in the old guard behind the dais. What started as a slow agenda item turned out to be a real firecracker of the public process. This column has directed considerable criticism toward the county Local Agency Formation Commission's heavy-handedness concerning Temecula's application to annex land southwest of the city's existing boundaries. I have been equally irate over the inexplicable contortions Temecula officials have assumed to genuflect and agree to whatever the agency has requested. Multiple items on the consent calendar of the Temecula council agenda are usually passed with one vote, but an item is pulled for discussion if one or more citizens submits a request to speak form. Three people requested to use the two minutes allotted for public comment on item 14 concerning a modification of the city's sphere of influence. The modification is an attempt to comply with the latest formation commission demand that the city remove part of the mapped sphere that has been in place since 1991 in order to be granted an annexation request originally applied for in June 2009. The annexation has been rejected and redacted by LAFCO, which incredibly considers the proposed Liberty Quarry in the far southwest corner of the county a "regional" concern. To my dismay, Temecula officials removed the proposed quarry site from the annexation application, and on June 24, LAFCO sprang the sphere-ectomy demand on the city. Item 14 began with a staff report that attempted to explain how the loss of the sphere was a gain for the city. Joe Hudson, an esteemed attorney from Fallbrook, earned the approving roar of the council chamber crowd as he vociferously disagreed with that conclusion. Hudson's comments apparently had a cathartic effect on some behind the dais. Councilman Mike Naggar suggested adding language to the resolution making it clear the City Council was engaging in LAFCO-directed sphere-ectomy under protest. Mayor Pro-Tem Ron Roberts delivered an uppercut that nobody saw coming by calling for a grand jury investigation of LAFCO over Granite Construction's apparent ability to inappropriately exert its will through members of the formation commission. Roberts has served longest on the council, but it is especially telling that he works for Riverside County Supervisor Jeff Stone. Roberts works within the belly of the beast, so his vocalization of suspicion is significant. It is great to see an old lion roar, showing that his position as mayor pro-tem stands not only for pro tempore, it stands for pro-Temecula. 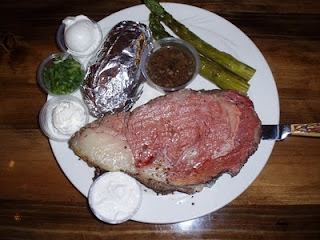 The prime rib practically fills the plate, comes with baked or mashed potato and veggies. Temecula City Councilman Ron Roberts on Tuesday night called for a grand jury investigation into the Riverside Local Agency Formation Commission, an independent body tasked with approving annexations in Riverside County. Speaking during a council meeting, Roberts said he's seen enough questionable behavior from the commission to warrant a grand jury probe. Each California county has a grand jury to serve as a watchdog over local government operations. Roberts' request followed a series of scathing rebukes by members of the public and council members of LAFCO, which last month approved the city's latest request to annex 4,500 acres of mostly undeveloped land to Temecula's southwest. The approval came with the condition that the city remove part of the proposed Liberty Quarry site from its sphere of influence. The sphere denotes areas of land outside a city that a city may one day annex. Last summer, city officials tried to annex the quarry site, along with the other land. City Council members are among the quarry critics who fear the mining operation will lead to air pollution and environmental degradation. The quarry's developer, Granite Construction, and quarry supporters say the project will have little impact on the environment while providing high-paying jobs and millions in tax revenue. LAFCO last summer ruled the quarry's fate was best decided at the county level. The commission on technical grounds rejected an appeal by the city last year that would have let Temecula annex everything but the quarry site. RIVERSIDE ---- A doctor told Riverside County officials Tuesday more than 100 Temecula-area doctors oppose a proposed quarry that would be carved out of the rugged hills southwest of the city, because of concerns it would harm area residents and particularly children. Dr. Daniel Robbins, a Temecula pediatrician, said, "It's directly upwind from where my patients live." His wife, Kristi Rutz-Robbins, a Temecula Valley Unified School District board trustee, also spoke out against the Liberty Quarry project during a public comment period at Tuesday's county Board of Supervisors meeting. "I would just like for you to remember me and remember the children when you begin to act on this permit," she said. The county is in the process of finalizing an environmental impact study of the project. There has been a lot of ink spilled on these pages regarding the proposed Liberty Quarry. Inevitably, people from both sides of this contentious issue invoke the facts. Unfortunately, facts have become malleable tools that can be shaped to fit whatever reality one wishes to pose, so I offer an opinion. Whether or not the science behind the negative impact of crystalline silica or the diesel exhaust of legions of trucks is accurate, it simply doesn't matter to me anymore. It is clearly wrong to locate an open pit mine in the middle of a wind channel that feeds us with a clean ocean breeze and makes our valley what it is. Just the idea of locating an asphalt plant and rock quarry there and disrupting the wildlife corridor or creating the potential for health risks is enough reason to oppose this project. As someone who has lived and worked all over this country, I can say that the most visible differences between really nice places to live and not so nice places generally comes down to zoning and landscaping. Cities are like living organisms. Their health and beauty must be proactively protected and maintained, or it will be compromised. Top-notch cities have residents and leaders who are ever-vigilant when it comes to protecting their communities. They do not allow undesirable businesses to locate in their areas. This location being so close to Interstate 15 will be a huge benefit for Granite construction because it will cost it less to transport its product to customers in San Diego County. However, there is very little worthwhile benefit to the Temecula Valley, and it could cost us dearly. Why should we sacrifice our quality of life so that Granite Construction can have a more profitable location? The domestication of plants and animals started about 10,000 to 12,000 years ago. This is what allowed humans to start growing their own food and living in one place instead of living the nomadic lifestyle of their hunter-gatherer forebears. Our primitive ancestors knew enough at that time not to house their livestock upwind of their living quarters. We should all be able to agree with this same logic and know that locating a mining operation upwind of our beautiful valley is a bad idea. This is far from settled, so please contact your county supervisors and tell them that you do not want a mine in that location. They want the tax revenue, but more so, they want to do what their constituents expect of them. If we do not work to defeat this, we will go from beautiful wine country to just another smoggy pocket of the Inland Empire. DAN BRUNELL lives in Temecula. WHO ARE RESIDENTS TO BELIEVE? FORUM: Who are residents to believe? Two letters published on July 1 attempt to convince us that there will be no health impacts from the proposed Liberty Quarry. One letter quotes a Patrick Hessel, Ph.D. First, to be clear, Patrick Hessel is not a medical doctor, but one of Granite Construction's paid consultants. Since Hessel is not a medical doctor, he does not treat patients. Dr. Daniel Robbins, referenced in one letter, is a medical doctor, and specifically, a pediatrician. He treats infants and children, many of whom have breathing and respiratory ailments. Robbins sees the impacts of bad air quality on his young patients, which logic dictates makes him more of an expert than a non-medical doctor doing a theoretical study of what might or might not occur. The Occupational Safety and Health Administration states: "Crystalline silica has been classified as a human lung carcinogen. Additionally, breathing crystalline silica dust can cause silicosis, which in severe cases can be disabling, or even fatal. The respirable silica dust enters the lungs and causes the formation of scar tissues, thus reducing the lungs' ability to take in oxygen." This same concern is echoed by both the Environmental Protection Agency and the American Lung Association. Certainly no one is going to develop crippling illnesses from short-term exposure to crystalline silica. However, the Liberty Quarry project is planned for 75 years, with up to 10 blasts weekly, which will provide area residents with long-term opportunity for exposure. Additionally, if there is no health impact, why does the draft environmental impact report speak about quarry employees wearing either face masks or respirators? These two letters identified only one of the many health issues. There is no reference to the 1,600 truck trips and the diesel particulates that will be emitted from these vehicles. EPA talks about: "Short-term exposures to particles (hours or days) can aggravate lung disease, causing asthma attacks and acute bronchitis, and may also increase susceptibility to respiratory infections." Regarding one letter's quote: "scientific document on the site-specific project done by Riverside County," but this document was not prepared by Riverside County; rather it was prepared by an outside consultant using much of the data provided by Granite Construction. Further, much of the data referenced in the draft EIR has been challenged by a number of notable sources. But Riverside County has stated: "The proposed project would result in significant and unavoidable impacts to air quality and traffic/transportation, which cannot be mitigated to below a level of significance." One letter references: "Granite has offered to do air monitoring in the city of Temecula." This would be after the quarry is operational. Since this proposed project has been in-process for five years, why has Granite not already done air monitoring at the proposed quarry site to establish a true baseline of air-quality data? So I ask you, are we to believe a Granite Construction-paid, non-medical doctor, or more than 100 medical doctors who have firsthand experience with patients and have signed up opposing the quarry? FRED BARTZ lives in Temecula.